Korean Traditional Garden ‘Soshoe-won’ and The Entrance to The Garden In Damyang, Korea. It is not easy to find the Korean traditional garden now days. At first, introducing the characteristics of the Korean traditional garden seems helpful for you to understand and enjoy the Korean traditional garden. The Korean traditional gardens mean the gardens of Choson dynasty. It is impossible to find out the gardens made in other dynasties except Choson. The traditional gardens in Korea had the strong influence from the Confucianism and the Taoism. In the case of the Gardens, the Taoism seemed stronger than the Confucianism. In my opinion, it would be natural when we though the real meaning of the garden, taking a rest there. As soon as arriving at Soshoe-won, I bought a ticket and walked into the garden. The road to Soshoe-won garden was dream like scene. Here, the meaning of Soshoe is clean and clear, ‘won’ means garden. Soshoe-won is located in Damyang area, the west south area of the Korean peninsular, near Gwangjoo city. Weather of this area is warm and mild to other area in Korea, so the bamboos are so popular in this area. You can enjoy the bamboo forest on the way to the garden. Actually, the bamboo has cool characteristics among the trees. So you could feel cool atmosphere by the road. At first you could see the small pond at the very first entrance. The scene of the pond was so beautiful with the sunlight. As walking into the garden, there was a wall and small pavilion with dried grass straw roof. The patterns of the wall made by the stones and the muds seemed so humble and friendly. What you can feel from the wall is the core of Korean culture and its characteristics, in my view. It looks so refreshing in there at a Soshoe-won garden, it really looks clean and clear because of the bamboo forest around. If there is a pond around then it will complete the whole ecosystem of Bamboos. I wish that I could visit such place too. Great travel pictures, thank you for sharing. I'm thinking that standing water is not drinkable. It is so nice in Damyang. I am actually planning to visit this region when the weather cools down a little. As if I'm always travelling with you @slowwalker, whenever I came across your posts. The Garden looks so peaceful not only clean and beautiful, I believe the air is so fresh in there. I love the bamboos, they're quite different from here in the Philippines. This really makes me eagerly wanting to visit Korea...Oh how I wish! Beautiful. How I wish to just travel the world and not worry about the money. It looks so beautiful and transmits tranquility that landscape. here meaning of Soshoe is clean and clear, ‘won’ means garden. Acually you great. Traditional park in the city of damyang very beautiful ,, rattan tree also looks very neat, looks clean and very beautiful ..
Wow! The garden is so beautiful. Nice photography. Beautiful garden .. place looks calm .. I believe it should be a great place to visit alone. Wow @slowwalker I’m always super impressed by how beautiful the scenery is in your posts. Thank you for sharing this beautiful landscape with us! Stunning images ! beautiful garden ! 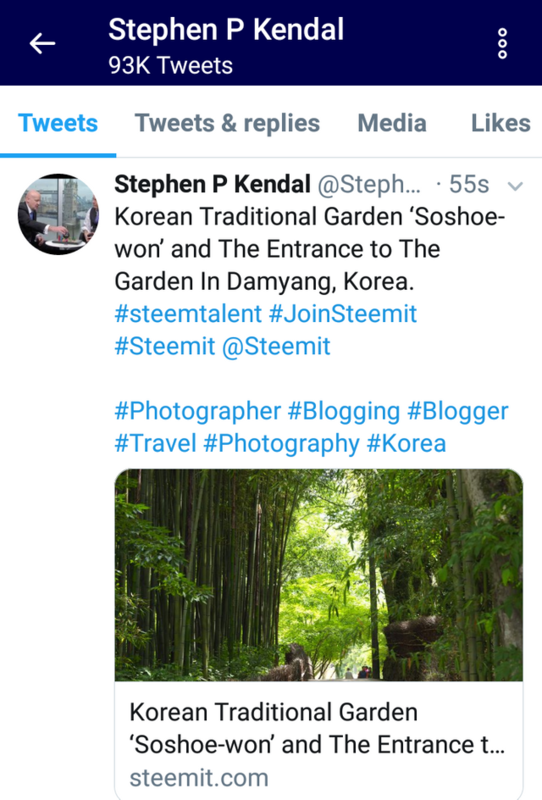 @slowwalker, Korean Traditional Garden ‘Soshoe-won’ wanna brilliant location for being relaxation & meditation. Cool environment with bamboo trees. Garden and small pavilions reminded traditional villages. I went central province of village my country 3 months ago and seen like these properties. Wall patterns so adorable. I'm pretty inspiring today with cool photo clicks. Triple gem bless you. Wow so much beauty and so much green, I would love to walk through that Bamboo forest and feel the freshness of that place, it can be a nice place to relax and with some watercolors paint something fresh and beautiful. Always your post is inovative..
A wonderful story about the gardens. You have the talent to see the beauty in ordinary places. Good luck to you and love. Замечательная история о садах. У Вас талант видеть прекрасное в обычных местах. Удачи Вам и любви. Beauty surrounds us always, but usually, we need to open our eyes and know it and appreciate the beauty of this Mother Earth. Great pictures! 😍 Love the green! And it all looks very peaceful! Hi @slowwalker, I didn't know your blog. I'm amazed by your picture and the way you describe Korea to the world. What di you use to shot them? I am into Macro photography. Your trip to Korean must have been amazing! They seam to be so peaceful this gardens. Great article @slowwalker ! One of the most beautiful gardens i've ever seen! thanks for sharing this amazing place!